Set on the banks of the Arkansas River, the U.S. Marshals Museum will be housed in an innovative facility named the Mary Carlton and Robert A. Young III Building. The Museum will feature a unique exterior with a modified star-shaped design signifying the star badge worn by courageous U.S. Marshals. 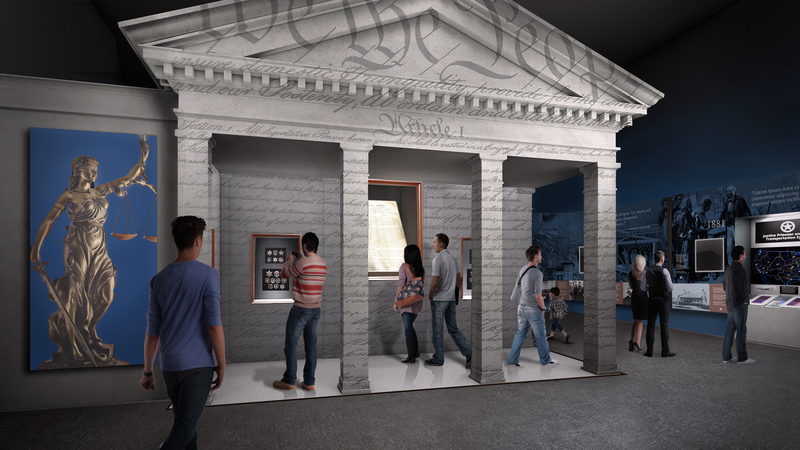 Inside, five immersive galleries will educate guests about the critical, ever-evolving role the Marshals have played in upholding the Rule of Law, driven by justice, integrity and service. 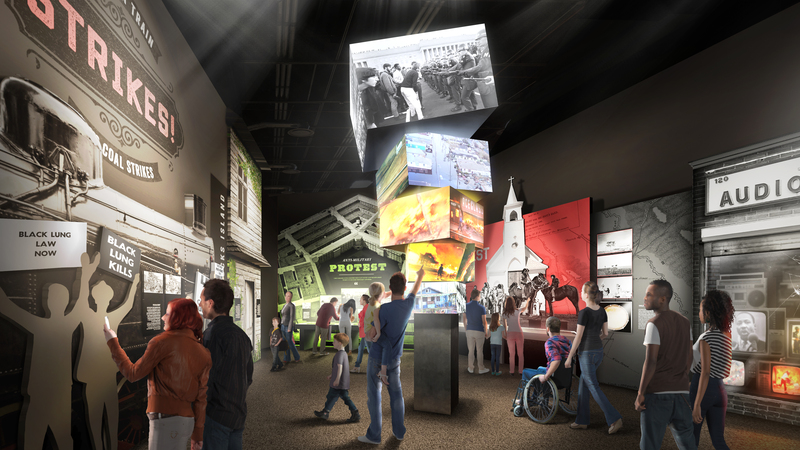 The Museum’s National Learning Center will combine the Museum experience with education programming focused on the Constitution, the Rule of Law and civic literacy. It will engage local and national audiences using a variety of resources. Guests will also get to pay tribute to the more than 350 Marshals killed in the line of duty since 1789 by visiting the Samuel M. Sicard Hall of Honor. In the first gallery, you will be led to understand the role of a Marshal, how the agency was founded, its principles and duties, and a broad overview of its history. You’ll explore a high-level timeline of the history of the Marshals, beginning with the inception of their role in the Judiciary Act of 1789 and continuing to the vital work of the Service today. Set into the timeline, a series of interactive exhibits will uncover the different types of work for which the U.S. Marshals are responsible, from supporting the courts to protecting witnesses, and from tracking down fugitives to managing operations for disaster relief. 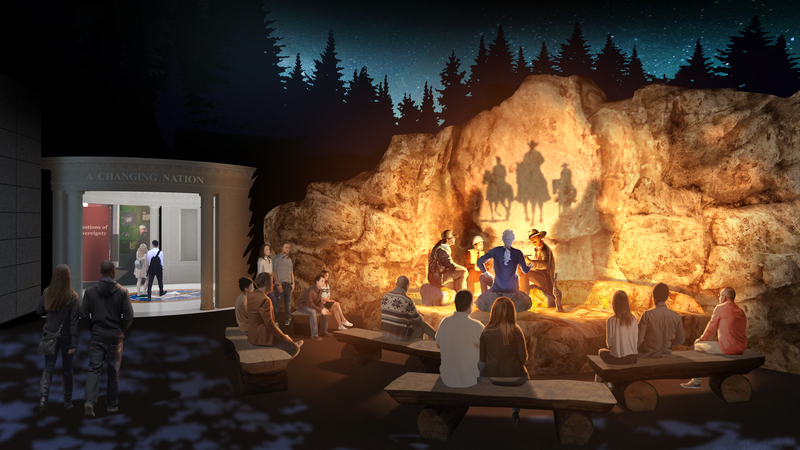 Positioned as a central hub in the Museum, the Campfire will provide the stage and setting where storied moments of marshal history will be presented. On an elevated dais at the center of the room, a group of four figures from different eras sit around a flickering campfire. Shadowy images shift and play across the walls of the space, as storied moments of marshal history flare briefly to life and then fade away in media, and voices float in with scraps and fragments of tales and memories of Marshals’ lives and achievements. You’ll want to pause and sit a while, listening and watching as the stories play out and the mood of the space changes. 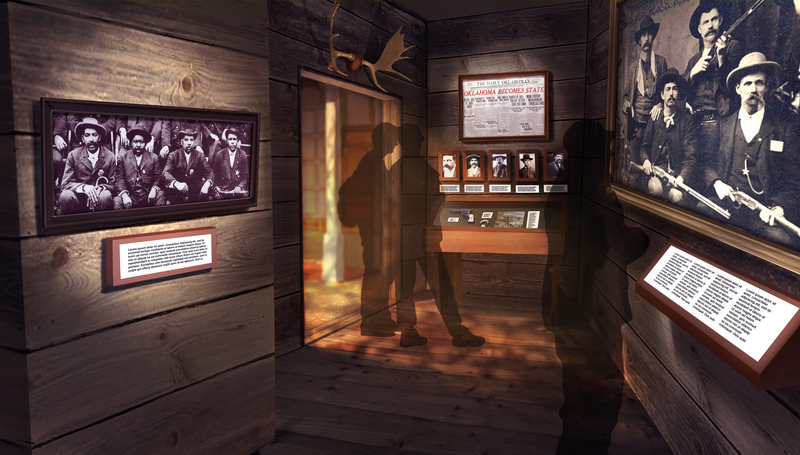 As you continue on your journey through the Museum, you will return to the Campfire area, discovering new stories each time you visit. In the newly formed United States, the Marshals were truly the first lawmen. From those early colonial days, the Marshals’ role evolved into expanded responsibilities and challenges as they became the symbol of law and order in the western frontier and Indian Territory. Through a variety of exhibits depicting an Old West frontier town such as a saloon and a Marshal’s office, tales of Frontier Marshals will come to life, including some about Fort Smith’s iconic frontier figures. A particularly intriguing part of this gallery is the exhibit that tells the incredible story of Bass Reeves, a man who escaped slavery to later become a United States Marshal. Tactics that walked the line between guile and guts were used for survival by Frontier Marshals – just as they are used by U.S. Marshals today. As you leave the frontier, you’ll enter a more formal, pillar framed gallery themed with the idea that Marshals are bound by duty to uphold the law, however ideologically distant they are from the Marshal’s own beliefs. A series of portals will lead to three rooms, each focused on a specific broad area of challenge within this duty. In the final portal, you’ll step into the Decision Theater in which you’ll journey into the ever-changing, complicated work of the Marshals Service. You’ll examine the role of the Marshals during the struggle for civil rights in America and their involvement in integration and the protection of justice for all. Scenes and exhibits will also acquaint you with how the Marshals have played a central role during turbulence such as Prohibition, violent white supremacists protestations, riots, bombings, and natural disasters. In this fascinating gallery, you’ll be immersed in the active, exciting, and expansive work Marshals do today. 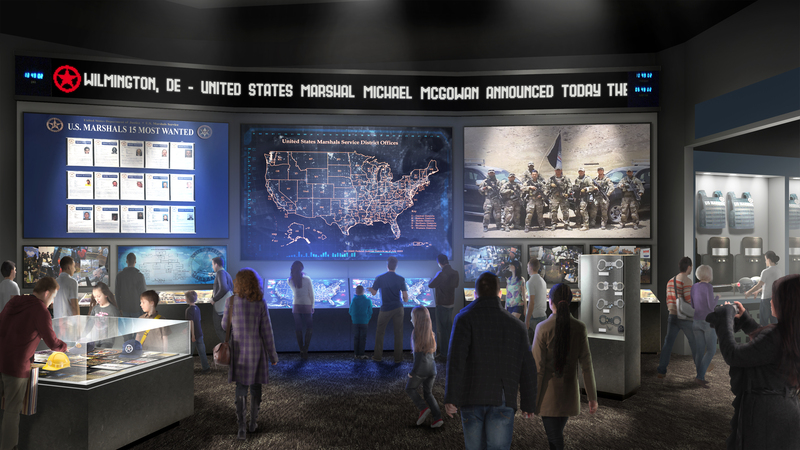 Exhibits here will showcase the tactics and technologies utilized by the Marshals in their tracking, apprehension, and extradition of fugitives in the U.S. and dangerous environments such as Iraq and Columbia. The names and faces of the 15 Most Wanted will be shown on a running display along the top edge of the room. At the core of this gallery you’ll hear “What We Stand For,” an inspiring explanation in the words of Marshals – present and past – speaking of why their work matters, what it has meant to them and others, and what the future holds for the Marshals organization and the nation they serve. Beyond the open area of the Museum’s lobby and seating area, you will find the Samuel M. Sicard Hall of Honor, an exhibit honoring the Marshals, deputies, and special deputies who have given their lives while serving our country. 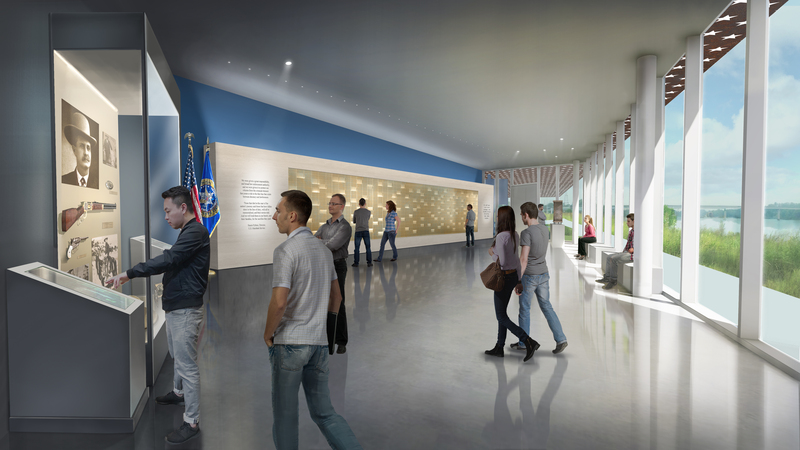 In this beautifully lit and peaceful space with a wide glass wall looking out across to the Arkansas River and the Oklahoma countryside, the Hall of Honor will proudly display the names of all the men and women who fell in the line of service, many of them in or near Fort Smith. Also in this area, you will find a digital interactive display to help you dig deeper into the stories of these fallen Marshals and the sacrifices they made. Using a simple touchscreen interface, you can browse and search the list of Marshals by name, date, location, or even incident. For some Marshals, there will be a full register of information: photos from family members, oral history remembrances, documents, and more. For others, there may only be a line or two.